A couple of weeks ago, my nephew Erik graduated from high school. In itself, this is not particularly remarkable, since we have a very large family and every year or two there is somebody graduating from someplace. Indeed, I have two beautiful nieces, Emily and Ashley, who graduated this spring as well. 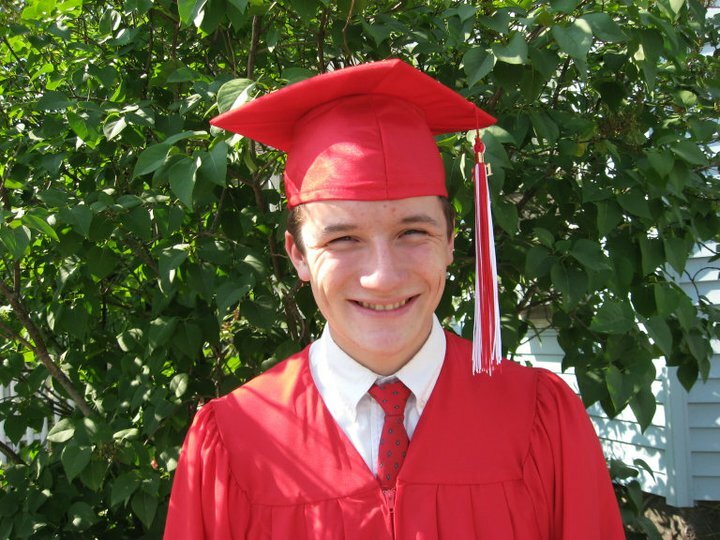 But Erik’s graduation is special, because Erik has Asperger’s Syndrome. When Erik was first diagnosed, I had never heard of Asperger’s. I was to find out it is a mild form of autism, characterized by complex challenges in learning and an inability to pick up on social cues . I knew that Erik did not act exactly like most other kids his age. His learning seemed splintered- he excelled at some things, but others were very difficult for him to learn. His speech and language were delayed. School was a struggle because he was unable to memorize. It took him years to learn to pedal a tricycle and he didn’t read until he was in third grade. To me, he seemed like a serious little boy whose slightly robotic way of speaking gave the sense that he was totally unconnected to what was going on around him. I was wrong. Erik was connected. He just connected differently from most of his peers. Year after year, he fought to keep up. He was socially awkward, especially during middle school where the kids called him names like “spec” and “retard.” He would get so upset he was physically ill. Unlike children who may not realize they are different, Erik knew. He knew he was not as fast, or as agile, or as sociable as his siblings. Born into a family of athletes, Erik found team sports difficult, because the action transitioned more quickly than he was able to process. Basketball and soccer were too fast. He tried karate, but memorizing the sequences of the katas was difficult. Again and again he tried, and while he struggled, his siblings excelled. It was frustrating. It was disappointing. But like all of us, Erik had a choice. He knew he could dwell in the trenches of self-pity, or he could recognize things for what they were and make the best of them. Erik chose the latter. When his siblings excelled, he reveled in their success. Over and over, I saw Erik stand in the shadows of his siblings’ victories, and over and over heard the pride in his voice as he told me how fast his brother ran, or how many points his sister scored. Last summer, we sat together at the beach, and I asked him what he wanted to do after high school. He looked down and kicked at the sand. “I want to go into the Service,” he said slowly, “but I can’t because of the Asperger’s.” His voice betrayed his disappointment, and it broke my heart. I worried about his future. But I should have known better. Erik does not give up. He found that he could excel as a swimmer. He plowed through his high school courses and finally, he donned a red cap and gown and graduated with his class. At the beach last Sunday, I looked at my nephew sitting across the blanket from me. He is tall and slim and handsome, with muscular shoulders like his dad. He grinned when I offered my congratulations, but did not stop to bask in the accolades. In true Erik style, he quickly took off to test the water with his younger brother and sister. As I watched his silhouette against the horizon, it occurred to me that sometimes life is a team sport. We choose sides carefully, selecting those individuals who are the strongest and fastest and smartest to join our team. And often, we pass over people like Erik -those who take the spotlight off themselves and shine it on somebody else. Those who celebrate the victories of the team instead of the victory of the star. Those who walk instead of run, but keep walking. What Do Children and Elephants Have in Common? 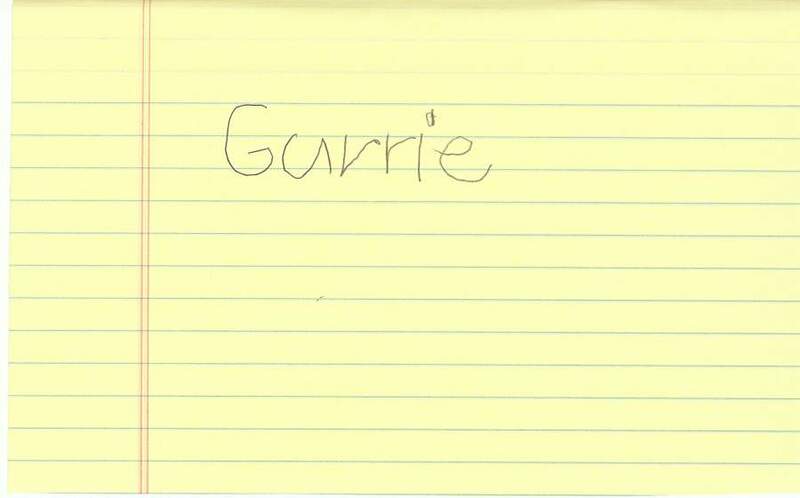 I watched a crowd of children at a bus stop recently, and my mind immediately flew to my introduction to first grade. I was exceptionally excited to begin school, especially since I would be allowed to carry a plaid school bag and ride the big yellow bus that had carried my older sister Martha-Jean every weekday for the past three years. I was six years old and at least four inches shorter than Martha-Jean, but I had made it my life’s ambition to try and keep up with her. 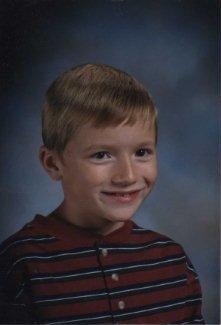 Shortly after beginning first grade, I discovered that school was not the bright happy place I had imagined. Although my memories of Saint Ann’s School are cloudy, there are shards of clarity that break through the haze and pierce me as if it were yesterday. The playground was a square of pavement that surrounded a dark brick structure. It was separated into quarters, one for the little girls, one for the little boys, one for the big boys and one for the big girls. Martha-Jean was a big girl. I was not. I hovered at the edge of the line of demarcation, longing to be with my older sister, who was fearless and bold, because I was afraid. Then source of my fear was a teacher named Sister Lucien. Sister Lucien was a she-devil, a dragon-fire witch in a black habit, who ate small children for her lunch. Sister Lucien’s kingdom was the afternoon session of the first grade. She was the queen, we her subjects. In my memory, Sister Lucien has no face, but she has a voice. A voice with a thick French accent that screamed intelligible syllables to unsuspecting first graders. I had no idea what she was talking about, but each afternoon, I stared at the pages of my French book and pretended to follow along. Sister Lucien obviously thought that six-year-old children control what time the bus arrived at Saint Ann’s because when it was late, I had to do penance. I knelt on the hardwood floors, trying to remember not to rest my bottom against my heels, wondering why the bus driver wasn’t doing penance and why I was. One day, I was called to print my name on the black board. I gripped the chalk hard and printed slowly, trying to make my letters perfect. At last I was finished and stepped back to admire my work. Sister Lucien was not impressed. “Is… your… name…Gummy?” she screeched. I looked at my name, realizing that the “a” wasn’t completely closed and the “rs” ran together. I stood red-faced and mute, and looked down at my scuffed shoes in humiliation. The next ten minutes were spent in the corner, rapping my knuckles with a ruler, provided by Her Majesty herself. One day, the class was told to line up and carry our papers to the front of the room. There was a girl in my class who wore a heavy metal brace on her leg. Born at the end of the Polio epidemic, she walked with a severe limp. She hurried to find her way back to her seat, and as she rounded a corner, her braced foot slipped on the waxed hardwood floor and she fell, bumping her head on the desk. She lay crumpled on the floor, crying, as Sister Lucien rushed to her side. I know what you are thinking. This was the opportunity for Sister Lucien to redeem herself, to show the gentle, kind side that must have motivated her to become a nun in the first place. This was her chance to be that “mother-away-from-home” that all first graders need. My mother, a teacher too, would have gathered the child in her arms, soothed and coddled, kissing away the boo boo. Sister Lucien assessed the child and then made a statement I shall never forget. Now, you would think that with a horror story like this, I would have hated school for the rest of my life, but that is not the case, because after Christmas I was transferred to a public school where I flourished under the watchful eye of Mrs. Cassidy, a smiling lady who wore lipstick, smelled like flowers and never raised her voice. You would also think that I would want to forget those days at Saint Ann’s. But I learned some valuable lessons there. I learned that I will never understand or speak French. I learned to print my name clearly. And I learned that children never forget. What lasting impression do you want to leave with the children in your life? I recently read that several classic breakfast cereals are in danger of being discontinued. The list included such old favorites as Special K and Cheerios, and got me thinking about the breakfast foods I ate as a kid. I grew up at a time when parents fed their children the caloric equivalent of a five course dinner before school every morning. 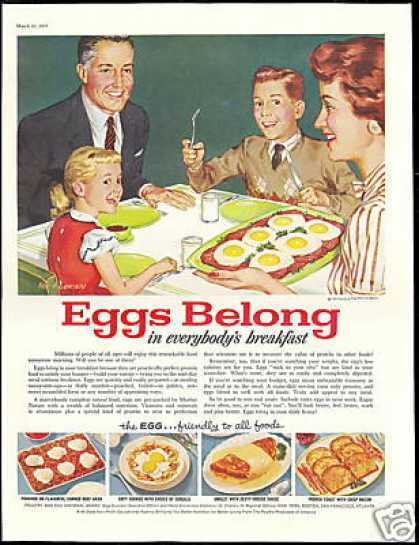 Much like the breakfast scene in “Pleasantville,” my mother’s idea of a morning meal included hot cereal, eggs, toast, hot cocoa and juice, and we were expected to eat them all. Every morning, there was a large pot of oatmeal, Ralston, or cream of wheat on the stove, sometimes served with raisins, and often sprinkled with brown sugar. Eggs were scrambled in a cast iron fry pan, and toast was sliced from huge loaves of homemade bread, and dripping in butter. Prepackaged toaster pastry and instant breakfast were anathema in our home. During the dog days of summer, we were allowed to eat cold cereal. 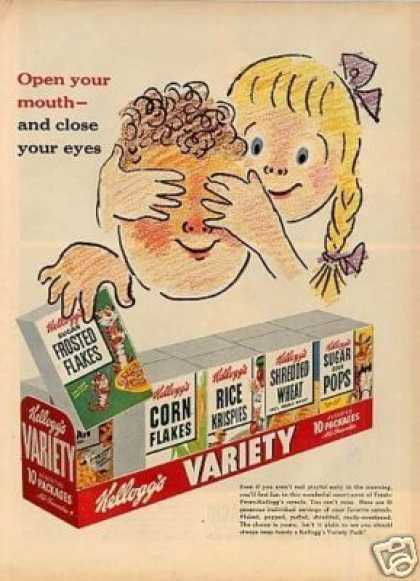 Corn flakes, Shredded Wheat and Cheerios were staples in our pantry, punctuated by special times when my mother brought home Wheat Honeys and Rice Honeys. And on very rare occasions, we were given the breakfast treat of all treats- the Variety Pack-little single serving boxes of cereal, mostly presweetened, with perforations to cut open so that (gasp!) after pouring in the milk, you could eat right out of the box. We kids thought we died and went to Heaven. We demolished a ten- pack in one sitting. Probably my mother’s most creative breakfast idea came after I was out of high school. She decided to offer my younger brothers and sisters grilled cheese sandwiches and tomato soup for breakfast. Her reasoning was sound- the meal contained all the major food groups. It was hot. It filled bellies. They loved it. I don’t think any of us still eat it for breakfast, but it remains a family favorite for lunch or supper. When I had my own family, I didn’t share my mother’s dedication to cooking huge breakfasts. Abby had a habit of fainting if she didn’t eat right away in the morning, so waiting for eggs or a pot of hot cereal wasn’t an option. Instead, I made my kids “teddy bear toast”- a slice of toast slathered with peanut butter and a sprinkling of raisins to form eyes, nose and a smile. I bought instant oatmeal. And yes, I confess, sometimes I bought presweetened cereal. I tried to limit it to snack time- I figured it was no worse than eating cookies. All three kids would sit on the living room floor to watch an hour of Sesame Street, while munching on dry Cocoa Puffs from a plastic Tupperware bowl. Then I realized if I stored the cereal and bowls on the bottom shelf in the kitchen, the children could get their own breakfast and I could sleep an extra hour on Saturday mornings. It was one of my smartest decisions. Now my kids are grown. When they are home with me, we stumble around the kitchen in an awkward morning ballet, stirring coffee and toasting bread. I breakfast on Greek yogurt with fruit and nuts. It’s healthier for me. It’s quick and easy. It’s low in cholesterol and high in calcium. But every once in a while, on dark New England mornings, I stir in my bed and long for the smell of oatmeal, bacon and coffee wafting from the kitchen. Mmmm… Breakfast of Champions! *If you do not know the Armed Forces’ name for this culinary masterpiece, ask any soldier. Momma G does not write swear words in her blog. 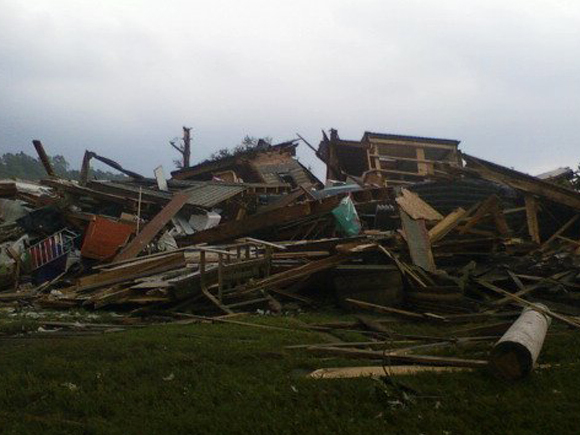 Last week my hometown was hit with a tornado. New England does not often encounter such natural disasters. Tornados are seen only every few years, and are usually rather small. 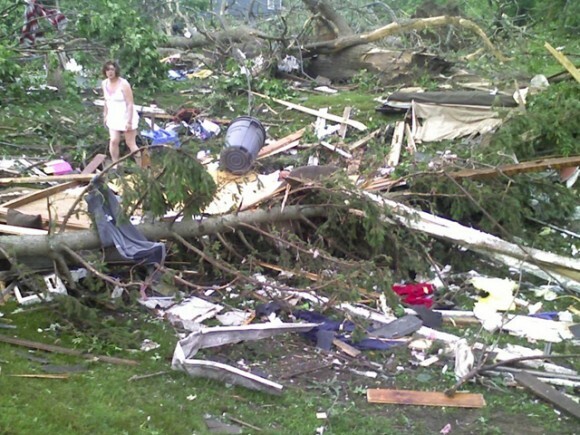 But these tornadoes were large and strong and destructive. In a fraction of a moment, a swirling black wind angrily devoured houses, businesses and churches, transforming a sleepy little town into a pile of rubble. From my apartment in New Hampshire I watched as the television screen showed the streets I had played on as a child. The First Church of Monson, known by residents as “The Congo” is a beautiful white church with stained glass windows that stands at the top of Academy Hill. Friends gathered there to give me a baby shower when I was expecting Abby. I played guitar in the sanctuary during summer sessions of Vacation Bible School, and sang there in a community Christmas choir. No matter what denomination people belonged to, everybody in town had been to the Congo at some time or another. 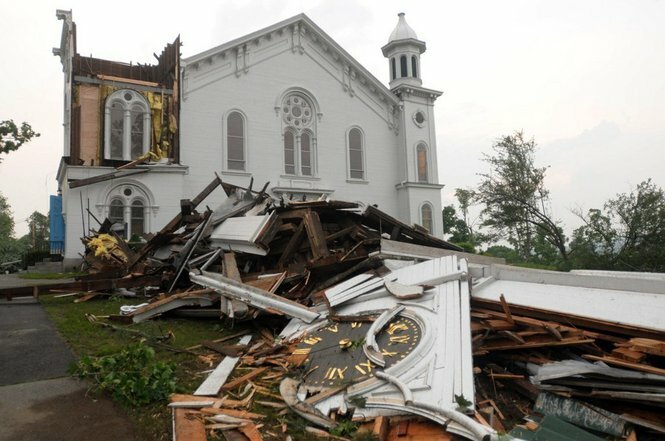 Now the steeple was ripped off and lay in splinters amid downed trees and crushed bushes. The grocery store where my sister Teri has worked most of her adult life is torn apart. The old Academy buildings are destroyed. Trees that for decades have stood sentry around the little hamlet have been snapped in half and lie strewn across roads like fallen soldiers. Cars teeter on their sides like children’s Match Box toys. I watched the screen, stared and the pictures and fought back tears. During the past several years I have watched people around the world cope with disasters- Hurricane Katrina, the 2004 Indian Ocean Tsunami, the recent earthquakes in Haiti and Japan. The world is brought into my living room through the flat screen across from my couch. I am moved. I feel sad. I feel helpless. I shut off the T.V. and go to bed, and in the morning, I go on with my life. But this time it is different. On the screen are faces that look vaguely familiar and I realize these are people I grew up with. I painted scenery with that woman tearfully hugging her daughter. I delivered newspapers to those houses that are now piles of toothpicks. I skipped rope with that lady searching for her cat. The man whose crushed car lies under a fallen maple tree played basketball at my high school. My heart aches for these people, because life as they knew it will never be the same. Whenever we experience trauma, the event marks the forever change in the continuity of our lives. We talk about the passage of time by marking the days before and after the event; Before the war. During the depression. After September 11th. When I was a little child, my hometown endured a horrible flash flood. Lives were lost, roads were eradicated, property was mutilated. The black and white photographs my parents took documented the vast destruction. The landscape looked surreal- huge crevices were carved into Main Street, and boulders the size of a small house lay on front lawns. If the pictures did not tell the tale, the people did. For much of my childhood, people from town talked about The Flood. What I learned is that the people of my home town were strong New Englanders, hearty as the granite buildings that withstood The Flood. They hugged. They cried. They cleaned up and they rebuilt. I look at the people from Monson now. Their homes are in ruins. Their lives are shattered. They will never bask in the naiveté that believes that tornadoes do not happen in New England, or that disasters happen to other people, but not to them. But I remember that the people in my home town are still strong New Englanders. They withstood The Flood before, and they will withstand The Tornado. They will hug. They will cry. They will clean up and they will rebuild.